If you're like me, a lot of movies have lost their zest to you. After seeing and writing about hundreds of films on this website, I've gotten to the point where the majority of films are so predictable I could tell you what happens in them scene by scene based soley off the trailer. They all follow a formula set by the dozens and dozens of precedents before them. Nicholas Sparks book adaptations are perhaps the easiest to decipher. If you've seen The Notebook, A Walk to Remember, Nights in Rodanthe or the recent Dear John, you're familiar with the endings. As I watched his latest, Miley Cyrus helmed feature, The Last Song, I couldn't help but continually ask myself: who's going to die in this one? Cyrus plays Ronnie Miller, a rebellious teen on her way down south to live with her father, Steve, played by Greg Kinnear, for the summer. She's a hardened person, already convicted of shoplifting, and she has a "down with authority" attitude. You can tell because she has a nose stud and wears leather boots. Watch out Lindsay Lohan! You may have some competition. Ronnie has a little brother named Jonah, played by Bobby Coleman, who is accompanying her on her stay. While he is excited to see his father, a person he has spent little time with since the divorce, she can't wait to go home. She hates her dad because he left her, but while there she meets a strapping young lad named Will Blakelee, played by Liam Hemsworth, who starts to turn her world around. Through him, she becomes happier and starts to reconnect with her father, but with only the summer to spend there, will she be able to find true happiness? If you take the time to really think about what happens at the end of these movies, you'll realize that all of them, with the exception of The Notebook, end without the relationship lasting. It almost seems like Sparks is a jaded lover, pessimistic from bad experiences brought on by past flings. Without saying how, The Last Song ends in a decidedly different way, not closing the book on the story for good, but rather implying future events. While it may not reach the height of The Notebook (and is barely recommendable by any standard of quality filmmaking), it's a sweet story with an ending that really works, sans the cheese. The biggest problem with Sparks' book-to-movie adaptations is that they never know when to quit. Instead of letting the emotion pour through naturally, they shove it in your face and try to force you to feel sadness. This is no deviation. I cared about all of these characters. Their performances were good and their chemistry was excellent. Cyrus and Hemsworth seem like naturals together (as they should since they are dating in actuality) and the father/son relationship between Greg Kinnear and little Bobby Coleman is as precious as can be. When tragedy struck (as was inevitable), I cared. I didn't want the events to play out this way. The movie had done its job. It had me in its grasp, so why so maudlin? Why take the emotion you've just spent the last hour and a half building and crush it under the weight of schlocky sentimentality? What started as a somewhat uneven, but still solid little tearjerker went the way of Nights in Rodanthe and A Walk to Remember. At the end, when I was supposed to be sad, I was fighting back laughter solely so I wouldn't ruin the experience for any of my movie going patrons who may have been tricked by its overemotional gushing. As the credits rolled and the lights came back up, however, I still found myself content with giving it my stamp of approval. It's funny, it's sweet, it's meaningful and it goes to show that you must learn to forgive those who have hurt you before the chance passes. 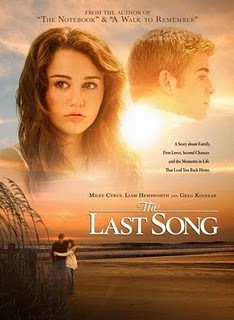 It's nothing special, but there's something in The Last Song that keeps its heart beating despite its problems.